Last night at the Santa Ana Star Casino, in Bernalillo, New Mexico, the state’s top prospect, Fidel Maldonado Jr. (13-1, 11KOs) lost his WBC Youth Lightweight belt to Obregon, Mexico’s Fernando Carcamo (10-3, 7KOs). The bout was the main event on Telefutura’s, Solo Boxeo: Battle in the Bosque, and co-promoted by Golden Girl and Golden Boy Promotions. A brightly lit ring, emblazoned with the Tecate logo, centered the Santa Ana Star Casino Arena as fans, media, judges, and television crews feverishly settled into position for the much anticipated fight card headlined by Albuquerque’s Maldonado and Carcamo. In the co-main event of the evening, Hector Munoz (20-7-1, 13KOs), of Albuquerque, stopped Baton Rouge’s John Revish (10-6, 8KOs), in the third round. 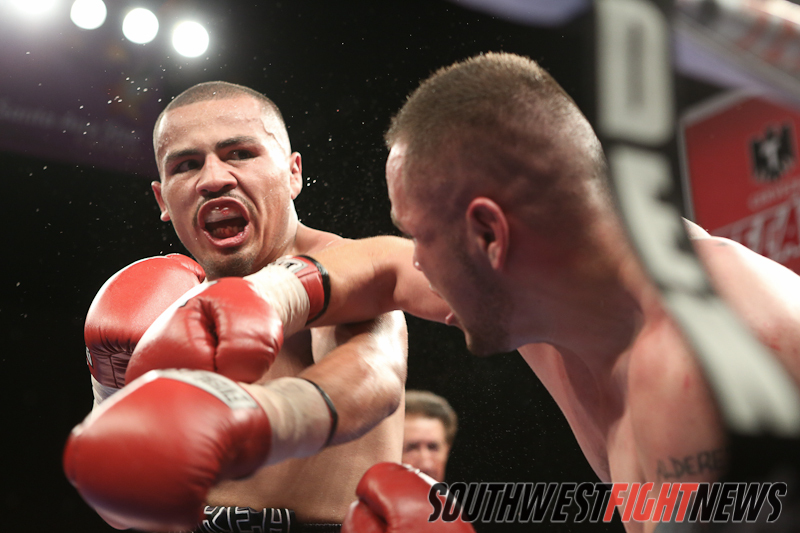 In his first defense of his WBC Youth title southpaw Fidel Maldonado Jr. fell victim to right-hander Fernando Carcamo. In the first round the two men came out very technical. The opposing stances led to a tangling of feet several times. 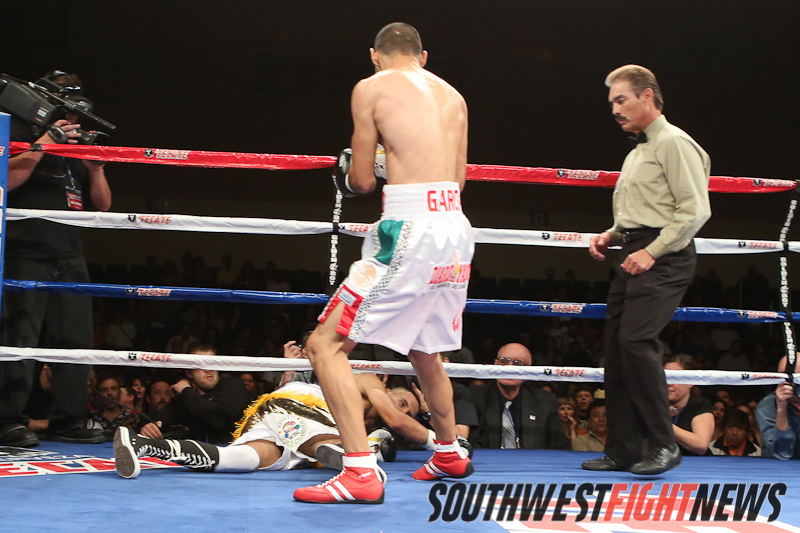 The highlight of the round came with 30 seconds remaining; Maldonado leaned into a Carcamo uppercut which floored him. During the break into the second round, Maldonado’s corner poured a large amount of water on him to try to help their fighter recover. At the start of the stanza, Maldonado was able to buy some additional time as the referee ordered Carcamo’s corner, to wipe down their side of the canvas which was full of water. Maldonado tried brawling out of his funk but was eventually caught with a short right cross that floored him a second time. A huge over the top left hook from Carcamo, following the eight-count, was enough for referee Rocky Burke to call a stop to the contest. It was a deadlock holiday for Hector Muñoz, winning for the first time in his last three attempts. Muñoz come out very aggressive, while Revish, was able to counter with slick hooks. Revish’s, view of Muñoz, became impaired in the first round as one of his larger dreads, came loose and flopped over in front of his face. Muñoz capitalized as his opponent was preoccupied grooming himself. Addressing the hairy situation, Revish, was more competitive in the second round, demonstrating very good ring generalship by slipping Muñoz’ advances and countering them with flush jabs and hooks. The Louisianan also displayed good balance, riding the ropes to stay away from the hometown fighters bullish advances. 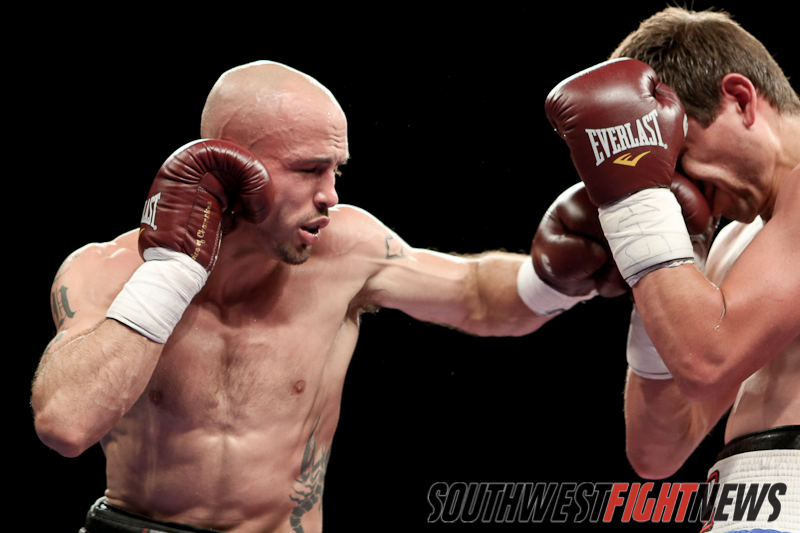 Muñoz was still, however, able to land sporadic punches that caused Revish’s nose to bleed. In the third, Muñoz, came out very aggressive, landing a huge left hook which led to a barrage of punches that Revish had trouble responding to. In two separate instances, possibly becoming disoriented, Revish inexplicably turned around during the middle of two of Muñoz’s combinations. Both times Muñoz was incredibly able to punch his opponent in the face, despite the fact his back was to him. Referee Rocky Burke, had seen enough and put a stop to the contest, as Revish was unable to intelligently defend himself. It was a rematch a year in the making but completely the opposite contest from the first time they fought. Montoya, displayed every weapon she had in her arsenal. Punching from several angles. She started the contest by switching from orthodox to southpaw finally settling with the latter. Roy was able to make it more competitive as the fight went on, taking one of the middle rounds. The two men carried their dislike for one another from weigh-ins into the ring, Saturday evening. Alderete demonstrated a chin so impressive that Bill Cowher would envy it. This slugfest tested both men’s endurance. Correa demonstrated the better boxing, landing more flush combinations and controlling the inside. Alderete landed several over the top hooks that helped him keep Correa at bay whenever he was trouble. The men demonstrated good sportsmanship, sharing a handshake and an embrace before the score cards were read. Hernández demonstrated good speed and power and great ring generalship, and he had to, to get passed Herrera’s turtle-shelled defense. Reluctant to throw early on, Herrera, eventually came out of this shell to land timely combinations. Hernández proved that he will be a force to be reckoned with for anybody in the light welterweight division. Watch out for this guy. 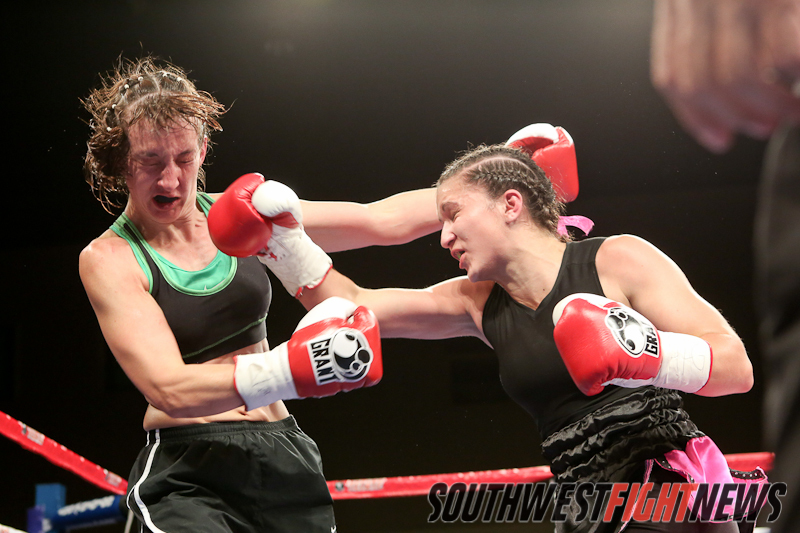 Heather Jo Clark of Albuquerque defeated Farmington’s Chavira Jack by split decision in her professional boxing debut. 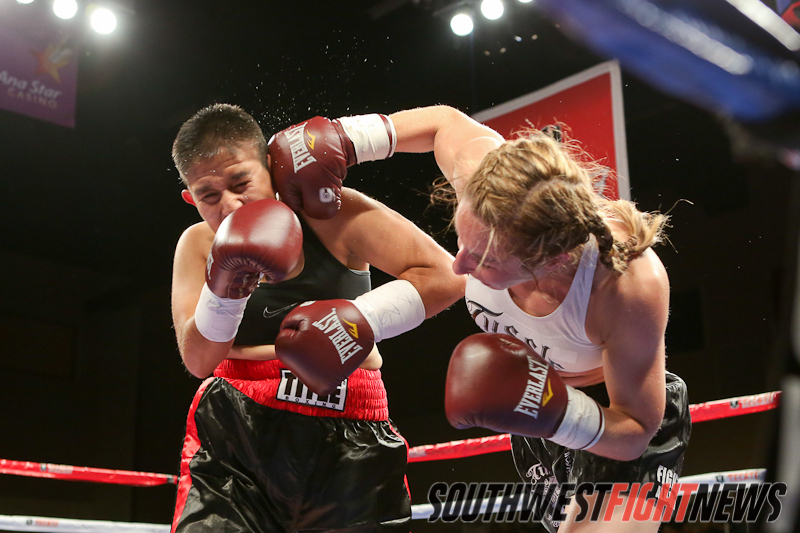 Clark was effective with right crosses and used her stamina to out-box Jack in the last round and a half. Despite the length and height disadvantage, Jack, was able to close the gap by starting her combinations with lead jabs and moving inside as soon as she threw it. The decision drew an even amount of mixed reactions from the crowd.